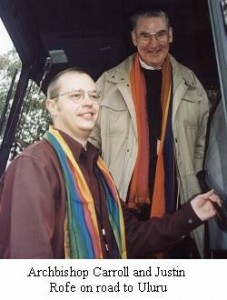 TO the lyrical chants of Hallelujah and flowing colourful ribbons, the leaders of Australia’s Christian Churches set off by bus from Canberra on a 3600 km pilgrimage to the heart of the continent last Sunday. The Pilgrimage to the Heart is Australia’s major ecumenical event to mark the Year of Great Jubilee. Leaders of nine Churches, eight of them accompanied by a young person, undertook the week-long bus journey which will finish with a Pentecost service of reconciliation in the shadow of Uluru on the morning of Sunday June 11. Pilgrimage director, Fr Tony Doherty of Sydney, said the journey’s aim was to celebrate God’s call to reconciliation in Australia Ð between the Churches, between cultures, and especially between indigenous and other Australians. Five years in the planning by the National Council of Churches in Australia, the pilgrimage was planned to coincide with the Week of Prayer for Christian Unity as a catalyst for Christian celebration of the Year of Great Jubilee. The Catholic Church is represented on the pilgrimage by recently elected president of the Australian Catholic Bishops’ Conference, Archbishop Francis Carroll of Canberra and Goulburn. He is accompanied by Justin Rofe, a youth ministry leader from Sandhurst diocese in the state of Victoria. Archbishop Carroll said he hoped the pilgrimage would deepen the coming together of indigenous and non-indigenous people, cultures and the Churches in Australia.
. Catholic Leader editor Marcus Kuczynski has been travelling with the pilgrims. His full coverage of the pilgrimage will be featured in The Catholic Leader next week.